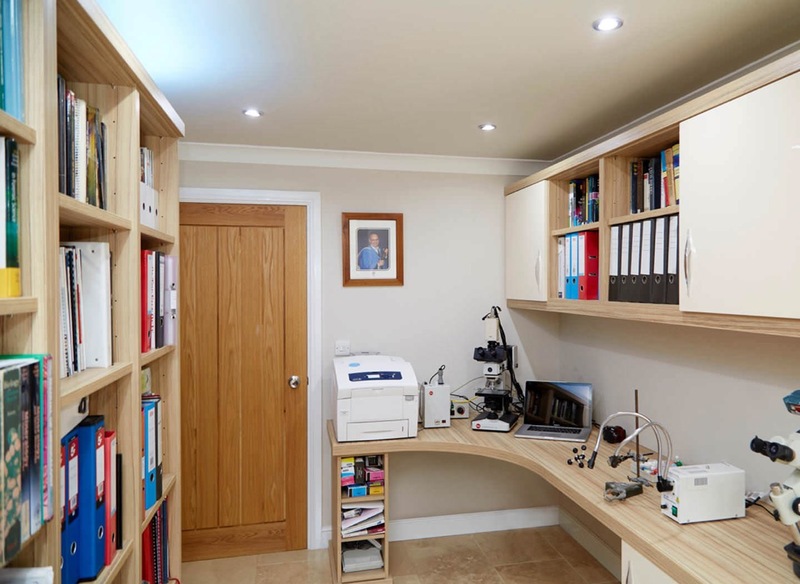 After knocking through a wall and creating an extension in his home, Professor Taylor asked Strachan to create a home office in his Shropshire home. As a mineral physicist, he required a multi-purpose space for all his equipment and documents, as well as an additional area for visiting colleagues. The large patio doors created a light and airy atmosphere in the room, so it was important to reflect this in the furniture design. The Capri range was the perfect match, thanks to its simple aesthetics and clean lines. The customer decided that he wanted a two-tone finish, with a light Granadillo woodgrain complemented by a High Gloss Cream finish, to reflect the light and add a minimalist touch. In order to make the most of his room’s space and deliver a sufficient working area, we incorporated a curved desk design. 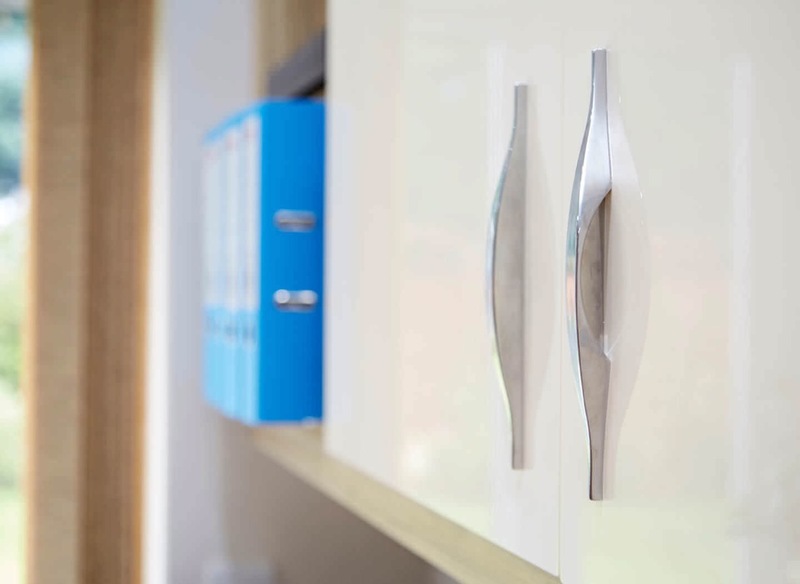 Crafted in a modern style, this curved shape allowed the design to flow around the adjoining walls for the most spacious result. 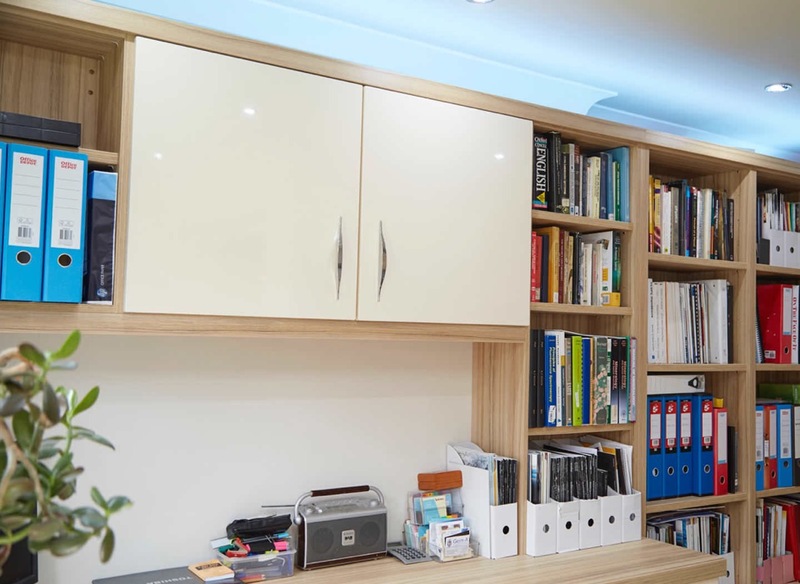 In order to neatly store Professor Taylor’s wide collection of books and documents, our expert design consultant suggested a combination of full length bookcase units along with suspended storage units. 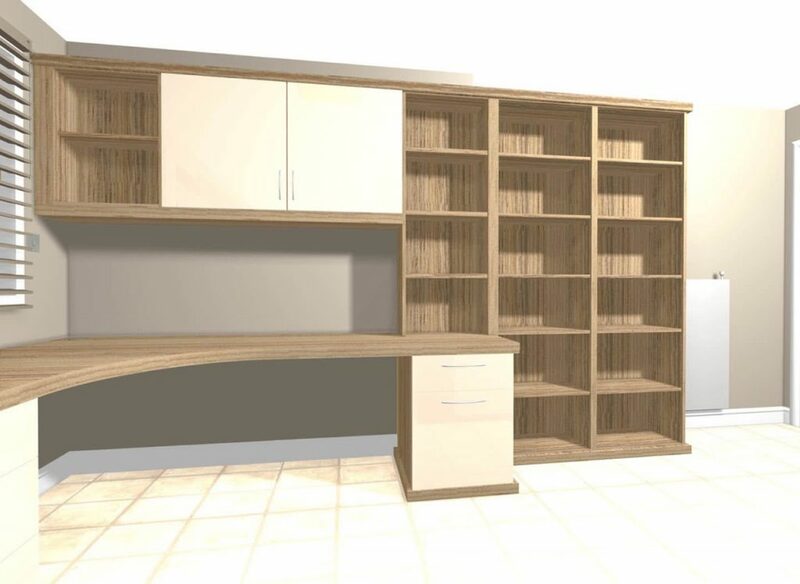 Positioned over the desk, this provides plenty of space to keep everything he needs within reach, while a concealed shelf unit allows him to stow items and stationary out of sight. Due to the nature of Professor Taylor’s work, one desk would not provide him with sufficient working space. 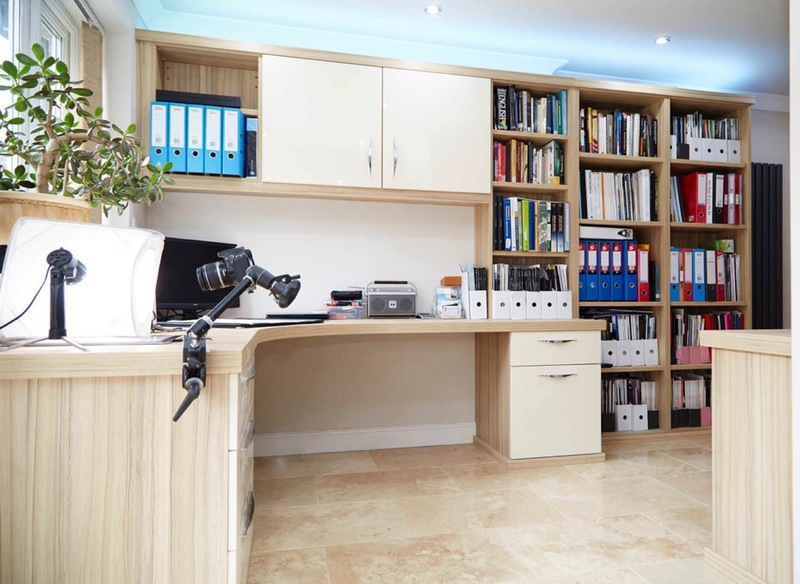 His Strachan designer therefore used the room’s long layout to incorporate another desk, together with additional bookcases and storage. 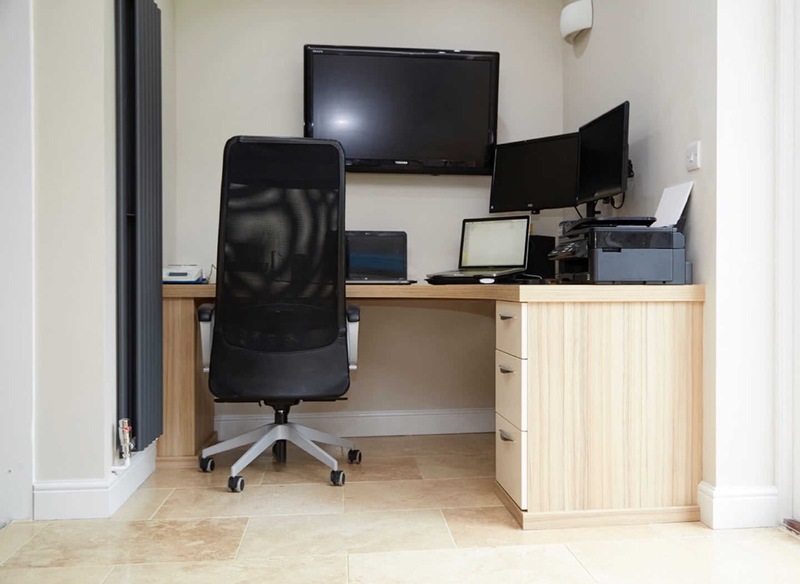 The desk doubles as a worktop space for all his equipment, saving him time by providing a permanent space for everything he needs and a separate area for his practical work. In addition to Professor Taylor using his home office facility through the week, he may also require a colleague to work alongside him from time to time. In order to facilitate this, as well as offering a wider variety of work options, Strachan fitted a compact corner desk, complete with integrated drawers.